It is quiet and dark here this morning. There is a little snow falling. Very peaceful. BUT - I have to get going. I still have a grocery run to make, some cooking to do, a table to set . . . We are doing Christmas Eve Eve dinner tonight. It won't be peaceful for long : ) Last year we set the table with blue and white, but I think this year we will put holly in glass vases and use crystal candle sticks. I know - you were dying to know that. Okay. My mind is on things other than blogging, but I did want to drop in here to wish you all a VERY MERRY CHRISTMAS! Have a great Holiday. And a very happy holiday to you, too. 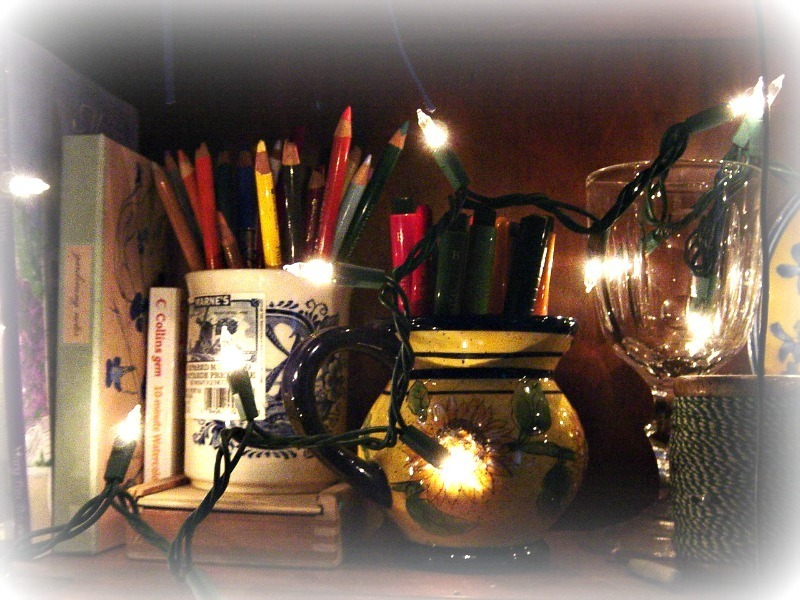 That's a charming photo of your decorated shelf. Thank you for taking time to share. Cheers! Thanks Suspinz - cheers to you too! Have a lovely Christmas Eve and Christmas, Catherine. 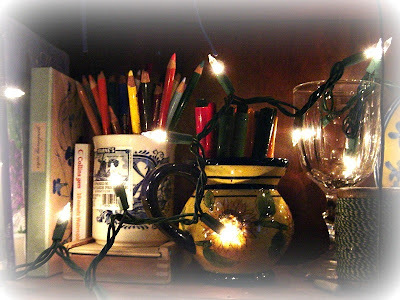 I have a string of greens with lights on MY shelves. I love yours. And as Suspinz says, thanks for taking time out to share. Annie - wishing you a lovely Christmas too! I love your decorations! I was wondering if you can teach me how to paint the clouds, flowers and how to use the brushstrokes while painting. I bought alot of watercolor sketchbooks from HobbyLobby that were on sale for 40% off. I wish you Happy New Year of 2012. Thanks so much for sharing your time and talents! I hear that the Big Snow is heading your way!. Thanks Diana. Your evening with family does sound lovely. Linda, Thanks, and happy new year to you. Hugs and happy new year to you Helen! I was thinking about the year 2000 a couple of days ago. You're right - these past 12 years have flown by! Sandhill - yes - it looks like we are in a snow globe. Happy new year! I look forward to another year of your inspirational posts and paintings. Marilynlara - thanks - I will do my best. Thanks for following along! Happy New Year.